Yuan Shikai becomes President because Sun was not able to win the support of the military. He began to campaign against the GMD using bribes and double agents. When this caused Sun Yat-sen to escape to Japan, Yuan completed his government take-over. Yuan's subsequent reorganization of the provincial governments after his victory set the precedent for warlords by designating an army to each provincial governor. Yuan agrees to most of Japan's 21 Demands, and protests are made against his leadership. He takes out massive loans to support his government. He becomes self-proclaimed "Emperor", thus losing of his power base, as the military felt he would be less dependent on them after his assumption of the monarchy. Violent protest in reaction to the terms of the Treaty of Versailles. China had entered the war in 1917, anticipating the recovery of the province of Shangdon that Germany had controlled. However, the land went to the Japanese, who had entered the war in 1914. May 4th started the movement towards a new culture, and a mass rejection of all foreigners, giving a more directed purpose to the revolutionaries. Mao participated by starting a newspaper The Xiang River Review, notable for his avocation of anarchy and denunciation of violent revolution: "we will not pursue that ineffectual 'revolution of blood.'" Started in Moscow, under the hidden, but active involvement of the Comintern until 1949. Mao is dropped from the 2nd Congress, but he is kept on in the party because of his excellent military skills. Under encouragement from the Comintern and the CCP, Mao became a member of the GMD. Members of the CCP were instructed by the Comintern to work with the GMD to bring China under a single nationalist government - First United Front. Sun Yat-sen dies of cancer. Chiang Kai-shek emerges as leader of the GMD. Under the leadership of Chiang, United Front forces overthrow many provincial warlords. Unites more than half of China under GMD. Right-wing elements of the GMD led by Chiang conspire with provincial warlord allies to purge left-wing leaders. End of the First United Front and the beginning of a bitter rivalry between the CCP and the GMD. Hedged in by enemy forces in the mountains, Mao is largely cut off from CCP and Comintern. In the mountains, Mao experiments with collective agriculture and builds a peasant army trained in guerrilla tactics. 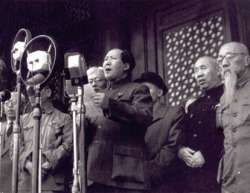 Mao joins other CCP leaders to establish the Jiangxi Soviet. The GMD launch the White Terror. Jiangxi Soviet is abandoned. Although Mao was not one of the initial organizers of the march, he takes command of the Communist forces after the first three months and set the army’s destination for a distant communist base in Shaanxi province (North-Central China). 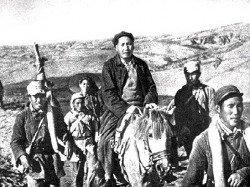 Sustaining heavy losses from disease, famine, and enemy attack, Mao leads Red Army through six thousand miles of rivers, swamps, forests, and mountains to reach its new base in the city of Yan’an. This shows the success of Mao's guerilla tactics and elevates him to a high position in the CCP. The first significant time when the pro-Bolshevik faction of the Party supports Mao (largely because they were disillusioned with the Comintern line after so many poor judgments of the military situation in China, such as those by Braun, who pushed for large-scale battles). Zhou Enlai starts backing Mao. Henceforth, Mao's military deviations from orders seem more legitimate. Mao is also put back in the Central Committee. Chiang needs support of warlord Zhang Xueliang, but Zhang refuses because he wants to fight Japan, not the CCP (+He admired Mao's tactics). He kidnaps Chiang, who is released after two weeks when he agreed to ally with the Communists (Second United Front) against the Japanese. Chiang's reluctance to fight the invaders was bad PR, so Zhang agrees to fly back to Nanjing as Chiang's prisoner to save the GMD leader some face. Instead of being released as planned, Zhang becomes one of the longest held political prisoners. Japanese forces were also pushing into the provinces surrounding Mao’s Shaanxi base, where they were met with effective resistance by CCP forces. Mao receives title “Chairman” of the Communist Central Committee and becomes a Chairman of the Politburo, making him the unchallenged leader of the CCP. Peace talks between the CCP and the GMD fall apart with the Americans supporting the GMD. To Mao, the "paper tigers;" or reactionaries, although they might look more powerful, were not to be feared because they only represent "reaction," where the Communists "represent progress." Later, this is the name that Mao gave to other countries that had more military strength than China, particularly in reference to the atomic bomb, to show that he was neither afraid nor impressed by shows of force. As the Japanese evacuate China, the conflict between the CCP and the GMD reemerges. Within a year, full-scale war erupts between the two parties. The GMD was initially successful in the north -captures Yan’an base. However, the CCP had already established a foothold in Manchuria, which their Russian allies had allowed them to occupy after the Sino-Japanese War. The CCP use this base to begin an aggressive military campaign to drive the GMD armies south. CCP forces h completely overwhelm GMD armies. Chiang flees to Taiwan/Formosa, where he installs the remnants of his GMD administration, claiming to be the legitimate government of China. At the promting of Stalin, Kim Il Sung of North Korea launches an offensive on South Korea to unite the peninsula under communist rule. Although most of the troops fighting against the North Koreans are Americans, they are UN forces, so according to treaty wording, the USSR does not have to become involved. China becomes involved as US troops push past the Yalu River. The united communist forces execute a successful counterattack, forcing UN troops to retreat. The war ends in 1953 with the Treaty of Panmunjom, which split the peninsula into the communist north and the capitalist south at the 38th parallel. • HyperInflation - price index in 1937 was 100, by 1946 it had risen to 378,217. +As recognized leader of China, Chiang has to fight the Japanese, but fails to do so. -Ends arranged marriages and concubinage. Women get equal divorce rights and equal property rights. -the GMD was so corrupt that it spawned a black market, these criminals had close ties to nationalists, tended to be capitalists. • Controversy of whether to force Agricultural Producers Co-operatives. Zhou Enlai and Lui Shaoqui felt there weren’t enough tractors and fertilizers, but the Central Committee backed Mao. In 1958, mandatory collectivization becomes mandatory. Collectivization was more gradual in China (Mao didn’t need violence forcing collectivization like Stalin did). -encourages Chinese to express their opinions about the government openly. Many intellectuals and writers respond with critiques of party policy. In a massive crackdown in 1957, those who had followed Mao’s encouragement to ”let a hundred flowers bloom, let a hundred schools of thought contend” are arrested and sent to Laogai. Mao used this campaign to expose 'enemies' within the Party. -Damaged Industry –backyard furnaces produces worthless steel (Uranium more successful), but continued to have it be produced so as not to admit failure/damage morale. -Lysenkoism –Socialist farming techniques (close planting) that don't work damage harvests. -Man-made famine –inflated figures claimed by villages meant that too large a % of grain went to the state. Poor weather in '59 and Mao's unwillingness to hear of the issue compound the problem. 1962 –Liu Shikai, Deng Xiaoping are supposed to fix the problem, but their kind-of NEP capitalism period (giving farming incentives like rural markets and introduce differentiated payment for skilled/unskilled workers) upsets Mao. 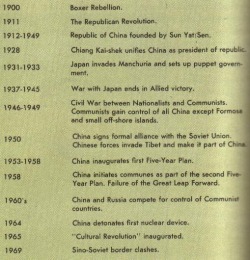 Mao's "Great Swim" –he steps back into power. The split is official as border clashes emerge.